Making art is integral to who we are; it brings meaning to life, strengthening our personal connections and responses to our internal and external worlds. Art teachers lay a foundation for continued practice, awareness, discipline, and persistence in their students. 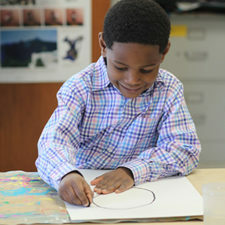 In the Lower School art room, all students can be successful. Lower School Art develops basic art skills, concepts, language, and attitude while letting the children’s imagination and individual interests fuel the content of their work. By providing an environment for freedom of expression, confidence increases as does a familiarity with a range of art tools and materials. Lessons are open-ended, reinforcing that there is no right or wrong way to draw or paint, allowing for creative problem-solving to occur. Beyond the process of making, students gain an understanding of art through discussion and analysis of art works across time and cultures and their own creations along with the work of others made in class. In Middle School, students continue their focus on imaginative and critical thinking, while further exploring a variety of techniques and media. Painting, drawing, printmaking, sculpture and technology-based tools continue to be examined through the lens of contemporary culture and art historical precedents. 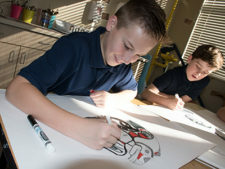 Students undertake projects that require problem solving and divergent creative thinking; they are encouraged to find unique, individual solutions to art assignments. In the High School Visual Arts courses I and II, freshman and sophomore art students explore the purpose and variety of visual arts in depth to communicate their creative ideas within the structured framework of a traditional art education. Students continue to learn about the language of visual arts, including art elements and principles, and hone their fundamental knowledge of composition. Students also examine various kinds of art forms from around the world through informative slide presentations and engaging class discussions. Carefully constructed art projects address two- and three-dimensional issues of composition, form, design, mark-making and color. Students experiment with drawing, painting, printmaking, digital image-making, clay and paper sculpting materials and techniques to unfold their artistic ideas. 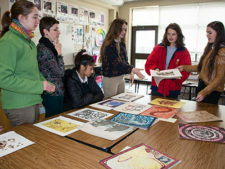 The International Baccalaureate Program (IB) Visual Arts Course is a two-year artistic journey that gives serious high school juniors and seniors the opportunity for a focused, first-hand experience in working with various traditional and experimental art techniques and approaches to enhance their own creations. Over the course of two years, students gradually move from teacher-guided art-making assignments and research to independent selection of theme, media, and content for their own artworks and investigation. The technical training offered by this course emphasizes proficiency with various drawing, painting, sculptural techniques and tools, the creation of real and illusionary forms, and the production of well-crafted works of art. Students also continue to observe the work of various artists from different times and cultures through slide presentations, reproductions, museum and gallery trips, and visiting artist lectures to explore the immense power of arts and motivate their own artistic voyage. An important goal for the IB art students is the development of a strong portfolio of artworks that illustrates their personal experiences and individual involvement. IB students utilize their visual arts journals to support, inform, and develop their studio work through sustained contextual, visual, and critical investigation. This practice assists students to better express their artistic ideas visually and critically evaluate their artistic growth.